Trumps had 6 babies – 4 boys and 2 girls! A weekend of successes! Scoop became a neutered champion, Kelly became a tracking champion, Nina got her Rally Novice title and Tango got her Rally Advanced Excellent title. Thankyou to those dedicated owners for putting in all that hard work! 2016 Agility Nationals – a huge event with 5800 entries! 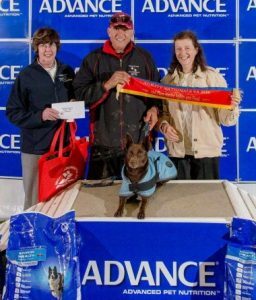 – Spice won Novice Jumping 400 and came second in Novice Agility 400 – Zadi came 6th in Masters Agility 500. – Spice and Ruby came 4th (from more than 70 pairs) in Novice Strategic Pairs! Flash won Best of Breed (and best Veteran of Breed) in Luxemburg at 11 years old – she looks fantastic and I can not believe she is 11! Ruby competed in 3 JDO classes, for 3 quallis! and Scoop won Best Neutered in Group then went to a Rally O trial and got 3 quallis and her RN title! 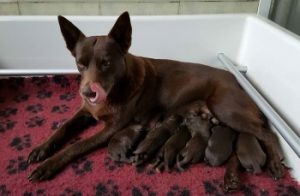 Button had her babies – 5 boys! 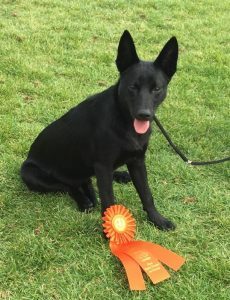 Ruby gained her last pass for her SAAD (Senior Australian Agility Dog) title. 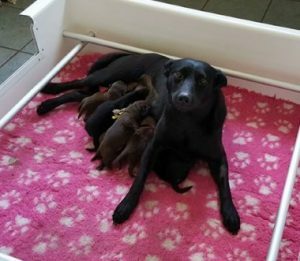 Pepper had her 9 puppies – ultrasound was spot on! 3 chocolate girls, 3 chocolate boys, 2 black girls, 1 black boy – what a mixture! 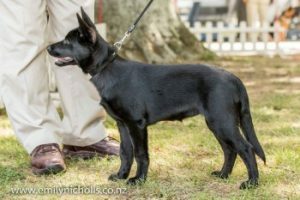 Tam won Best Puppy in Group in South Australia, and Tango finished her Neutered Championship title in Qld! Taroo’s second show and she won runner up baby in show! 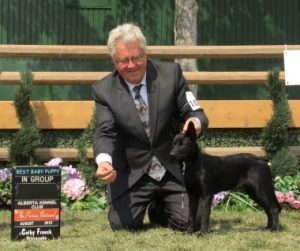 Taroo (in Canada) had her first show , and won Best Baby Puppy in Group! Tango got her Freestyle Intermediate title! Kiah won a 3rd in Group and then a 2nd in group in Canada – giving her enough points for her Canadian Championship – the first Callicoma to ever get that title! Liq and I flew to Cairns and stayed with Jan and Button and Nancy. We went to 5 shows up there. Liq needed 3 points to finish his Australian Championship and he got 30! He also won an Open in Group and an Aust Bred in Group. But the most exciting part of the trip was Button won Best in Show at one show and Best in the Working Dog Group at another!!! And baby Nancy won 5 x best baby in group and 2 x best baby in show – what a holiday! Qld hosted the National Championships for DWD and again Tango got a quali in both HTM advanced and freestyle advanced! 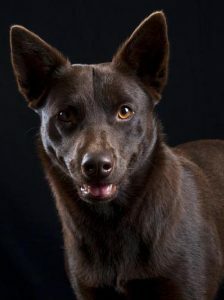 So proud of everyone out there doing things with their Callicoma kelpies!